Well since my last post, which was two weeks ago, I hadn’t had a fly rod in my hand until yesterday – making it an entire month without the rod. I think that is a record for me, usually it’s a few days tops! I gave a lesson on friday afternoon and seeing as the weather was alright, which for the way it has being going, is a bloody top notch forecast. I made the decision to get out fishing after the lesson for the hour and a half before dark, pike was the target. I tackled up and set to work working the fly around all the various features trying to tempt one of the toothy beasts from its lair. About 20 minutes in and one had indeed decided to attracted from its den and gave my fly good thump, evidently thinking that was enough to get me excited then let me down without bothering to hook itself. It chose not to stick. That was the end of the action. 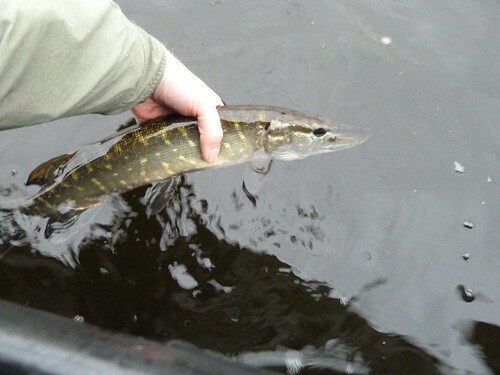 The canal has been kicking my arse with the pike fishing, one follow and two takes for no fish landed is the result after 5 or 6 sessions – when will they stick?! Today was a bit different again – it was my annual outing with my uncle on one of his fishing club’s days. 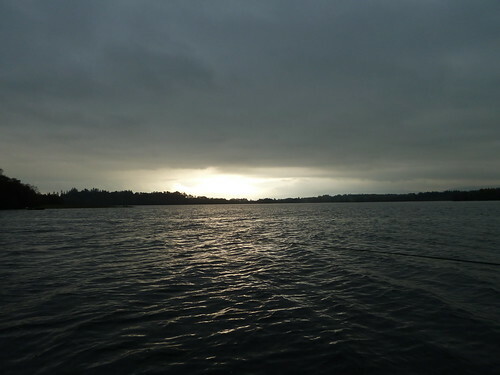 We were fishing the Lake of Menteith which I’ll be the first to admit is not my cup of tea given it’s a stocked fishery but it was a good day out and some wild fish were certainly caught…. dropping some hints here! The light was crap all day, this photo was taken just before midday and whilst the exposure was set a bit lower than normal it still shows what it was like. Excuse the wonky horizon! The fishing was slow for the morning session, my uncle had nothing and I managed one small jack pike. The afternoon session brought better fortunes, with much calmer water and some rising fish. Quite a lot in fact but they weren’t particularly interested in anything. I went on the small scale but they must have been feeding on micro-emergers! 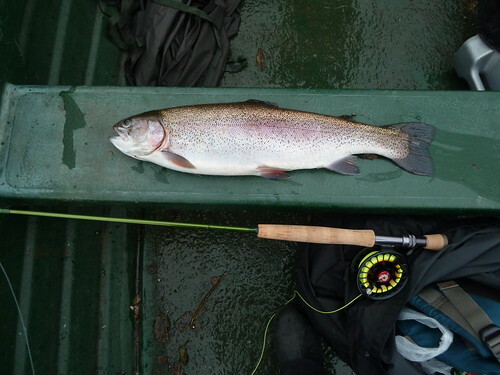 I managed a nice rainbow of just below 4lb – yes I know it’s a stocked fish, and the picture doesn’t do it justice but its the best conditioned farmed fish I’ve seen. 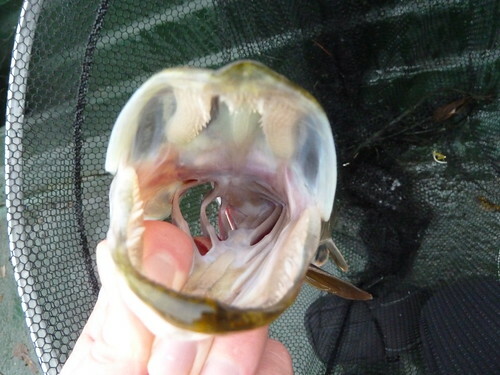 It was fully finned, gorgeous colouration and fought like something possessed. It’s moment of glory came when my uncle netted it, it decided it wasn’t having it and leapt straight vertically a couple feet out the water managing to escape – at least the hook held! The day ended with a lovely wee perch for me. 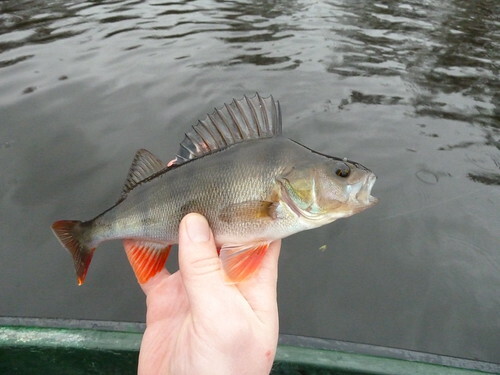 My first ever perch and on the fly too – I was stoked. I was never a coarse fisherman before getting into fly fishing so haven’t done the whole worm and float thing for perch. It was a welcomed addition to my species list. A great day out with a pike, trout and perch completing a wee grand slam.